As I awaited the storm and the early release from work on Friday, I got more and more excited for Sunday River. With no early release, and few flurries coming down, I got on the road and I heard “continue on I-95 for 115 miles.” (It was actually even farther than that.) After I got off the highway, Maine was dark. Really dark. I called a bunch of my Oregon dia-buddies and they helped to keep me smiling. I don’t get to talk to them very often, so long car rides are the perfect time to catch up (and for those of you worrying about talking and driving, I’ve got a head set for my phone.) And then, all of a sudden, I was in Bethel and I had made it. I was getting to see some of my favorite people: my ski family. We got up early on Saturday morning and were almost out for the first chair. We flew down the mountain and within an hour needed to take a break because it was cold. So a cup of coffee, some water and taking the middle of Dad’s cookie, and I was ready to go again. We skied all over the mountain and I fought to make it to noon before heading in for lunch. It was cold! We went in (ski-in/ski-out is a beautiful thing for those of you haven’t experienced it), ate a delicious lunch of sandwiches and homemade soup, and got ready to head back out. I requested my favorite, albeit at one time most traumatic, trail: Shockwave. It is the steepest at Sunday River, and it was sheer ice. We finished and our legs were burning. But back up the chair for a few more runs, and then inside for the day. I should’ve gone and worked out, but needless to say that didn’t happen. 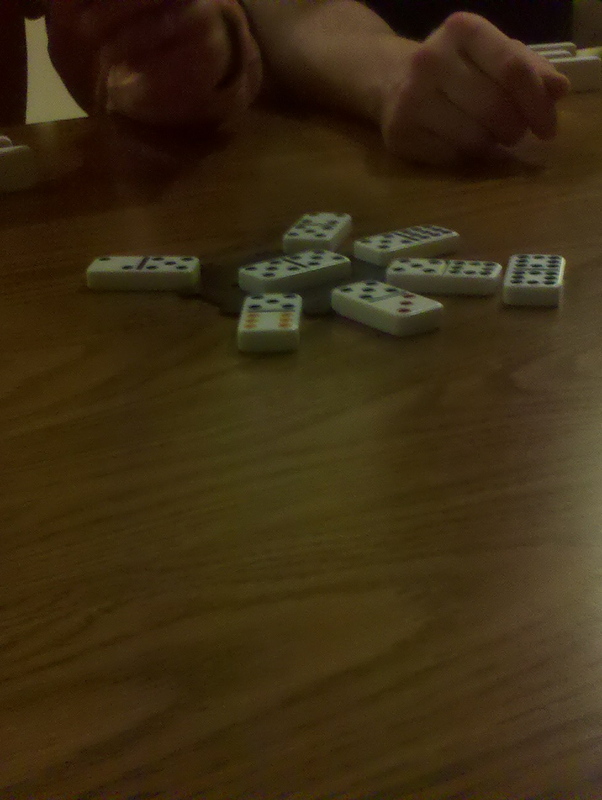 We watched football, relaxed, went to the store, ate dinner and played some dominoes. Now that may not seem like a big deal to most people, but this can be a very competitive game in our family. And I won! We watched more football and enjoyed lots of laughs, and went to bed early. But as we got up on Sunday, we weren’t in as much of a hurry. We still got on the slopes plenty early, but as we got to the chair, the ski patrol was sending everyone away. The chair was on a wind hold. I hate the wind. As a 9 year old, our chair almost hit the pole before they realized the wind holds were a great idea. We went down to South Ridge, and got on the Chondola, and on the way up, we decided to head back. At 9:30, we were inside, tickets vouchered and getting out of our boots. So yesterday was spent on the couch, with my feet up until lunch time when I got all my things together and headed back to my apartment. There were a few highs, a few lows, and lots of in betweens. A very good weekend; although entirely too short. I hope you all had a great weekend too.